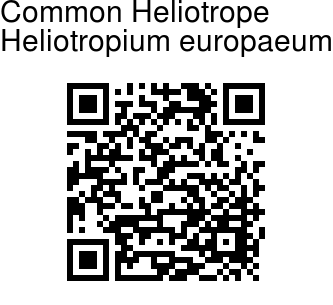 Heliotropium From Greek words helios meaning sun and tropaios meaning turning back: turning towards the sun. For plants that have flowers that turn towards the sun, a characteristic of many species known as heliotropism. 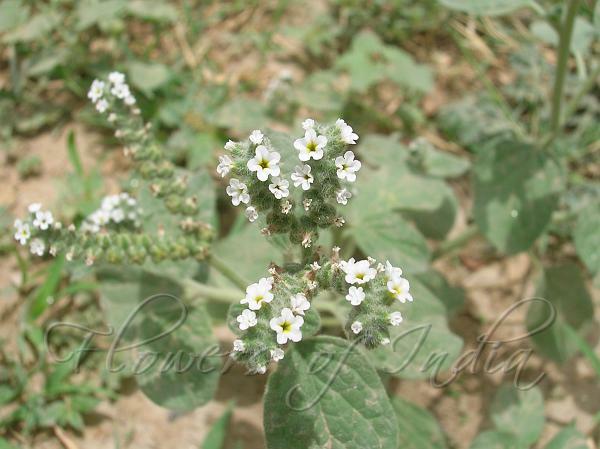 Flowers are small, blue or white, with 5 petals fused to form a tubular corolla with free lobes at the apex. Flowers arranged in strongly curled sprays which look like caterpillars! Stem and leaves covered with downy hairs. Leaves ovate, tapering at either end, and with smooth outer margins. Plant 6 to 30 inches in height. Plants establish quickly in fallows, stubbles and lightly grassed pastures, and is treated as a weed. Photographed in Sarita Vihar, Delhi.